Welcome to Wine Quiz number One. All the clues you need to answer most of these questions can be found on wine-pages.com. Please choose from the list of possible answers to each question. 1: What country is generally acknowledged to be the birthplace of wine? Georgia has evidence of the oldest winemaking, though some other countries not in our list of choices, including Iran, claim this too. 2: Rioja is a wine from Spain, but what is Rioja:? Like almost all of the famous classics of European wine, Rioja is named after the place where it is made. 3: The famous French wine Chablis is made from which grape variety? Chablis is always made from Chardonnay – and only Chardonnay. 5: Approximately how old are the trees used for the best French barrels? Oak trees at around 150- to 200-years-old are preferred by the best French coopers. 6: ‘Malolactic fermentation’ refers to which process? This is a natural process by which harsh malic acid is transformed into softer lactic acid. 7: Which glass is the ideal shape for wine tasting? A stemmed glass with a ‘tulip’ shape is ideal for wine tasting. 8: Chianti wines come from which region of Italy? Chianti is the most famous appellation within Tuscany, not far from the city of Florence. 9: What wine-making action is referred to as ‘Pumping over’? This process pumps red wine from the bottom of a tank to to be sprayed over the top of the tank. The purpose is to break the cap of floating skins and grape pips and re-submerge it into the wine. A barrique in Bordeaux is a small barrel holding 225 litres of wine – around 300 standard bottles. 11: What does “LBV” stand for on a bottle of port? Late Bottled Vintage Ports are aged for a long time in large wooden barrels before being bottled. 12: White wines can be made from? Because the juice of almost all grapes, green, red or black, is clear, white wine can be made from any colour of grapes as long as you separate the juice from the skins before fermentation. 13: In Burgundy, which is the highest ranking classification? Grand Cru signifies the highest ranked classification of Burgundy wines, both red and white. 14: In which larger wine region are Pauillac, St-Estephe and St-Julien? 15: What is this man doing? 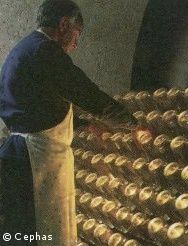 This is ‘riddling’ or ‘remuage’, the process of encouraging the dead yeast cells in bottles of Champagne into the neck of the bottle, before disgorgement. 16: Which wine is produced literally by ‘cooking’ it at high heat? Madeira is heated as a stage of the winemaking process, said to replicate the effect of heat on the wine as it made long sea voyages across the equator in times gone by. 17: The Maipo valley is a wine region in which country? This is one of Chile’s oldest wine regions, close to the capital city of Santiago. 19: Which of these wines is the odd one out? Pouilly-Fume is a Sauvignon Blanc from the Loire, all the others are Chardonnays from Burgundy. 20: Where are the Temecula and Paso Robles wine regions?